Originally New York 17, the Eastern Interstate 86 corridor was given high priority status in 1998, which led to interstate status. Designated in 1999, Interstate 86 currently extends from just east of Erie, Pennsylvania to the Pennsylvania state line at Waverly and from I-81 in Binghamton ten miles east to Windsor. The remaining portion of the route is signed as New York 17, awaiting upgrades to Interstate standards or the placement of I-86 shields. Specifically, key improvements are required in the Binghamton and Catskills areas. Ultimately, Interstate 86 will be signed across the Southern Tier, from Interstate 90 in Pennsylvania to Interstate 87 (New York Thruway) at Harriman, New York. Locales served by the routeinclude Erie, Jamestown, Olean, Corning, Elmira, Binghamton, the lower Catskills region and Middletown. The entire route is known as the Daniel Patrick Moynihan Interstate Highway (per SAFETEA-LU Section 1929). Proposed Interstate 86 in Pennsylvania and New York is part of High Priority Corridor 36: New York and Pennsylvania State Route 17. Interstate 86 does not follow any specific U.S. route with the exception of a small portion of U.S. 6 near the eventual eastern terminus. Interstate 86 was originally established by AASHTO on June 23, 1969 along a freeway corridor connecting Hartford, Connecticut with Sturbridge, Massachusetts occupied by I-84 at the time. Beginning at I-91 near Wethersfield, I-86 overlaid a portion of the CT 3 freeway (former I-491) to the CT 2 freeway at East Hartford, with an unconstructed section extending northeast to meet I-84 at Manchester. I-86 followed I-84’s course from this point northeast along the Wilbur Cross Highway into Massachusetts, ending at the Massachusetts Turnpike (I-90) north of Sturbridge. With I-86 overtaking the former course of I-84 from Manchester, I-84 was redirected eastward from I-86 along a freeway to Bolton, and ultimately toward Providence, Rhode Island. The section of Interstate 86 that replaced I-491 between Wethersfield and I-84 at Manchester was decommissioned by AASHTO on July 13, 1976. Cancellation of the freeway from CT 2 northward through Glastonbury and East Hartford preceded the I-86 removal. Signs for I-86 remained posted along the Wilbur Cross Highway between I-84 at Manchester and Massachusetts until plans for the extension of I-84 to Providence were officially dropped. I-84 was reestablished along its pre-1969 course while I-86 was formally removed. The freway spur between Manchester and Bolton was assigned as I-384. AASHTO approved these changes on May 23, 1984. Within the village of Painted Post, Interstate 86 meets the northern terminus of both Interstate 99 and U.S. 15. Originally constructed in the late 1950s as a traffic circle, the U.S. 15 and New York 17 exchange was converted to a diamond interchange in 1987. In September 1997, studies began on ways to improve the interchange and the nearby U.S. 15 ramps at Gang Mills. NYSDOT followed with preparations on the Draft Environmental Impact Statement (DEIS) in October 1998. This document was complete by July 6, 2001. By August 22 of the same year “Alternative 14” was deemed the preferred alternative. This option was modified after receiving input from the public in a December 6, 2001 Public Information Meeting. East from Exit 56 in Elmira to Exit 60 at Waverly and South Waverly, Pennsylvania was incorporated to Interstate 86 on July 31, 2013. Further east during the summer of 2005, upgrade work commenced on New York 17 around Owego and also between Windsor and Hancock.5 Funds for this purpose along with other sections of future Interstate 86 were allocated in the 2005 SAFETEA-LU. The stretch from Waverly to Exit 67 awaits I-86 designation, while work through Binghamton remains under construction. 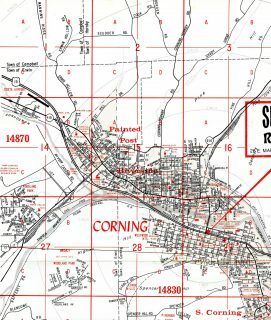 Corning, New York – circa 1981. East of the original circle interchange between the Southern Tier Expressway and U.S. 15 at Painted Post, New York 17 defaulted onto Dennison Parkway, a congested route through Downtown Corning. Now split into separate phases, The Prospect Mountain project, costing $148-million, includes work to reconstruct NY 17 to Interstate standards from Exit 72 (Mygatt Street) to New York 7 (Exit 4 on the overlap with I-81). Work reconfigured Exit 72, replaced bridges over the Chenango River and redesigned the interchange with NY 7. The majority of work ran through December 31, 2015. Phase II of the Prospect Mountain Interchange Reconstruction runs from spring 2016 through fall 2020. Work during this phase includes reconstructing Exit 4 with new bridges & ramp improvements, and additional bridge replacements along NY 17. This shield assembly marked the temporary end of Interstate 86 shield at the Chemung/Steuben County line. The ensuing stretch of NY 17 east to NY 14 was added to I-86 in 2004. Photo taken by David Greenberger (04/00). Interstate 86 previously ended beyond the interchange (Exit 52) with New York 14 near Horseheads. Photo taken 07/01/05. IThe first shield for Interstate 86 westbound preceded the New York 17 interchange with New York 14. Photo taken 07/01/05. Interstate 86 bypasses Corning to the north, connecting preexisting segments of NY 17 freeway. Photo taken 07/01/05. U.S. 6 splits with New York 17 for Bear Mountain. The state route departs the freeway next ahead of the New York Thruway. Photo taken by David Greenberger (05/30/00). Interstate 86 will conclude at I-87 just beyond the departure of NY 17 south to Suffern and New Jersey. NY 32 ties into this exchange from Newbergh, 15 miles to the north. Photo taken by Douglas Kerr (11/00). Two lanes join Interstate 87 (New York Thruway) south to the Mario Cuomo Bridge and New York City. A loop ramp joins the Thruway north to Kingston and the Capital District. Photo taken by Douglas Kerr (11/00). Exit 16 departs Interstate 87 (New York Thruway) northbound for U.S. 6 and New York 17 west to Harriman and Goshen. Photo taken by Douglas Kerr (08/31/02). Advancing 2.5 miles west from PA 89, Interstate 86 approaches Exits 1B/A for I-90. PA 89 north provides a cut off to I-90 east near the borough of North East. Photo taken by Jim Teresco (07/01). Interstate 86 defaults onto I-90 west (Exit 1A). I-90 passes south of Erie, meeting Interstate 79 16 miles to the west. Photo taken 10/01. An end shield accompanies milepost zero across from the gore point for Exit 1B to Interstate 90 east. Photo taken 10/01. The first eastbound Interstate 86 reassurance shield. The seven mile stretch in Pennsylvania traverses agricultural areas and timberland. Photo taken by Douglas Kerr (12/08/02). Two miles ahead of Interstate 86 east to Jamestown, New York on I-90 wetbound. Photo taken by Chris Elbert (07/06). Advancing to within one mile of the trumpet interchange (Exit 37) with Interstate 86 east on I-90 west. Photo taken by Chris Elbert (07/06). Exit 37 loops away from I-90 west to I-86 east ahead of Mina, Sherman and Chautauqua Lake in southwestern New York. Photo taken by Chris Elbert (07/06). Heading northeast from Pennsylvania 531 outside Erie, Interstate 90 next meets I-86 east at Exut 37. Photo taken by Tim Kubat (April 2006). One quarter mile ahead of the trumpet interchange (Exit 37) with Interstate 86 east. I-86 links with Pennsylvania 89 ahead of the New York State line. Jamestown is 35 miles to the east. Photo taken by Tim Kubat (April 2006). Interstate 86 branches eastward across the Southern Tier of New York as I-90 continues to straddle the Lake Erie coastline northeastward. I-190 to Downtown Buffalo lies 69 miles to the northeast. Photo taken by Tim Kubat (April 2006). Prior to the establishment of Interstate 86, the freeway east from I-90 was part of multi state route 17. 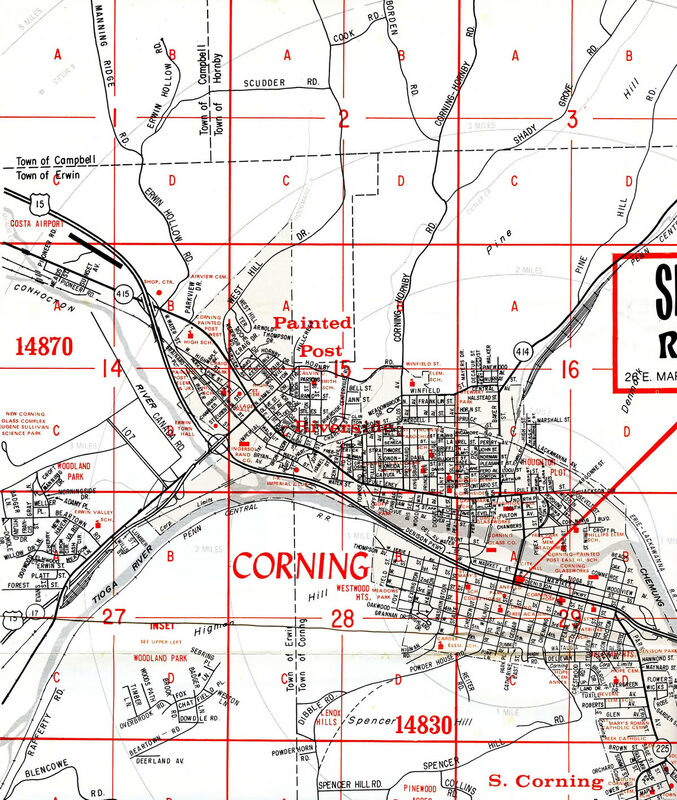 The original Pennsylvania 17 connects Blain and Liverpool to the north of Harrisburg. Photo taken by David Greenberger (07/30/98). Posted for a short period of time, this shield assembly acknowledged the previous route number of I-86 in Pennsylvania. Photo taken by David Greenberger (04/00). “I- 86 , Rt. 15 interchange under way.” The Leader (Corning, NY), January 7, 2004. “Route 17 And Interstate 86 Plans.” WBNG-TV (Binghamton), October 2, 2003. “Kamikaze Curve fixes won’t affect homes, park.” Press & Sun-Bulletin (Binghamton), October 3, 2003. “Kahler interchange grand opening today” The Leader (Corning, NY), July 7, 2004. “Ten-mile I-86 segment near wrap-up: Group updated on progress, costs” by Todd McAdam, Binghamton Press & Sun-Bulletin, April 8, 2005. “Long Stretch of Route 17 Becoming I-86 Today.” The Buffalo News, December 3, 1999. NYSDOT | I-86 – Project Map. “Interchange complete” The Leader (Corning, NY), August 14, 2008. “Governors Rejoice As Highway’s Final Section Opens.” The Buffalo News, October 3, 1997. Page updated June 8, 2015.